Imogen's Typewriter. 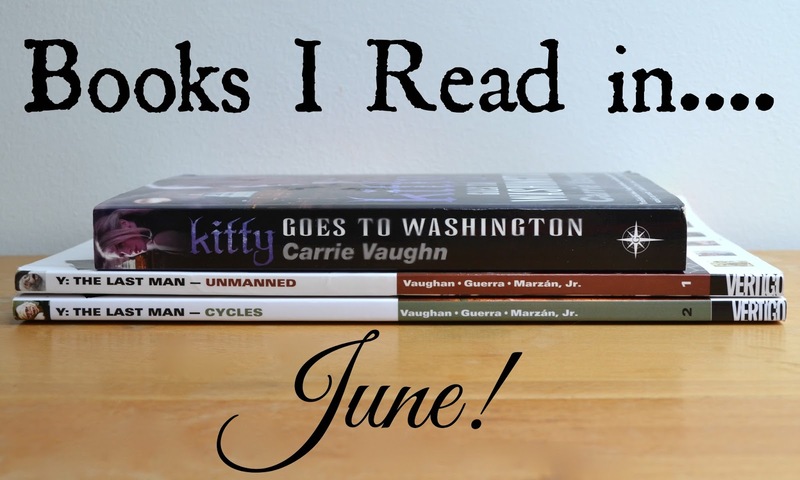 : Fiction Friday: Books I Read in June! This wasn't a good month for reading! The only novel I read was the last 100 or so pages of a book I'd started earlier in the year and the only other books I read were Graphic novels. Fortunately I've already completed by Goodreads reading challenge so I'm allowed to fall a bit behind. And I was really poorly; you can read about how I got my fiction fix without reading here! Now I read the first Kitty Norville book in March and really liked it. This second book moved on from the pack dynamics and growing up drama to political drama! We go with Kitty to Washington where she is called upon to talk about being a Werewolf, of course there are a few snags along the way and I did put this book down for quite a while and have no pull to pick it up again. What started in March took me three months to finish. But I did and I'm glad. If there's one thing Carrie Vaughn does well, it's speech. I love a good dialogue, monologue, anything. And there was a good chapter in this book where I was sad, seething and all around ready to punch one of the characters because of the speech. I empathised a lot. I do like this series, but this was not as strong as the first book in my opinion so I only gave it 3 stars. Y: The Last Man, Volume 1: Unmaned by Brian K Vaughn, Pia Guerra and José Marzán Jr. I waxed lyrical about this series in my Top 5 Summer Fiction Essentials and decided to re-read my copies, this series follows Yorick- the only man left alive, and his monkey ampersand as they figure out what the heck to do after everything with a Y chromosome dies. I really like the first trade of this comic book, the characters are introduced and it's really easy to connect with them and the apocalyptic element of the story really starts to sink in! I think Brian, Pia and José did a really good job. I recommend these books to anyone! Y: The Last Man, Volume 2: Cycles by Brian K Vaughn, Pia Guerra and José Marzán Jr. The second trade in the Y: The Last Man series is just as good as the first, they start to show more of the effects of every man in the world dying such as transport and food production. And of course the Amazons, women who have decided that every man dying was a good thing so Yorick better look out! I'm fairly certain all of my reviews for this series will be 4 or 5 stars because it's so good. This also had an extra sketchbook section at the back with Pia Guerra working out faces and designs of our main characters. Pretty cool. Favourite quote this month: "I'd never seen much reason to change my name just because it had become a hideous irony." At least Kitty the werewolf is self-aware! *My book links have always linked to Amazon buts of the 1st July 2014 I'm an Amazon Affiliate. This will not change anything!